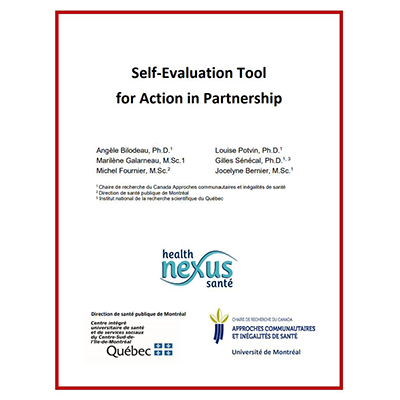 This document is a full translation and adaptation of the original tool entitled Outil diagnostique de l’action en partenariat, published in 2008 (second edition in 2014) by Direction de santé publique de l’Agence de la santé et des services sociaux de Montréal. and opinions about your partnership experiences. It was designed to be used by members of a partnership who voluntarily participate in self-evaluation. It is not designed for accountability purposes or for results-based management. Partners’ responses to each question form the basis for evaluating your partnership. You will learn its strengths and weaknesses, as well as ways to improve your partnership.